Get radiant, glowing skin overnight. This silky, soft overnight mask contains skin brightening ingredients that leave skin with a youthful, luminous glow. It is formulated with skin soothing and hydrating ingredients to refresh skin and restore softness. The leave-on formula works overnight to boost a more even skin tone, increase hydration and smooth skin. Apply after cleansing, apply a thick layer to the dry areas of your skin or to the entire face. You can use the mask as often as needed. Allow at least 20 minutes and rinse with lukewarm water, or let it sit for the whole night. Then apply an exfoliant, serum and / or a day or night moisturiser. I've used it 3 times now, once a week and I've only found out I've used it wrongly!! I've been using it as the last step after cleansing, toning, exfoliating, serum, only realised now that i should apply after cleansing if I want to leave it overnight!! My skin looks bright and youthful the next morning, makes me look less tired, i love it!! Has an increasing amount of research attesting to its effectiveness for brightening an uneven skin tone. Aqua, Butylene Glycol (hydrating), Glycerin (skin-replenishing ingredient), Dimethicone (skin softening), Niacinamide (skin-restoring ingredient), Olea Europaea (Olive) Fruit Oil (non-fragrant antioxidant plant oil), Hydroxyethyl Acrylate/Sodium Acryloyldimethyl Taurate Copolymer (dispersing agent/texture enhancer), Carrageenan (Chondrus Crispus) (texture enhancer), Arbutin (skin brightener), Magnesium Ascorbyl Phosphate (vitamin C/antioxidant), etanorulayH muidoS Crosspolymer (skin-replenishing ingredient), Arctostaphylos Uva Ursi (Bearberry) Leaf Extract (antioxidant skin brightener), Allantoin (skin-soothing), Isohexadecane (texture enhancer), Echium Plantagineum Seed Oil (non-fragrant antioxidant plant oil), xilaS Alba (Willow) Bark Extract (soothing plant extract), Hydrogenated Lecithin (skin-restoring ingredient), Polysorbate 60 (binding ingredient), Citric Acid (pH adjuster), Xanthan Gum (texture enhancer), Hydrogenated Phosphatidylcholine (hydrating agent), Phenoxyethanol (preservative), Potassium Sorbate (preservative), Sodium Benzoate (preservative). 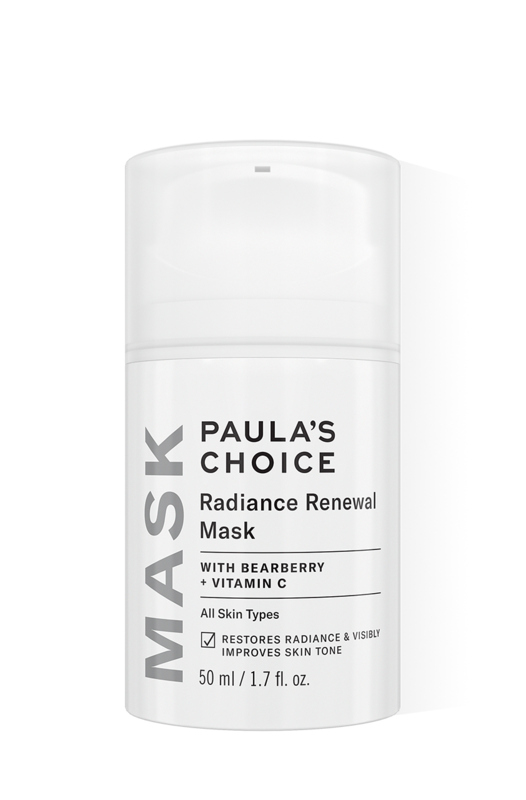 What is the difference between the Radiance Renewal Mask and other similar products? The Radiance Renewal Mask is formulated for all skin types to promote a more radiant skin tone and texture. The gel-like formula provides light hydration while soothing ingredients improve skin tone and texture. While most night time masks on the market are cream based, the lightweight leave-on formula of the Radiance Renewal Mask provides unique benefits appropriate for all skin types. Can I use the Radiance Renewal Mask during the day time? The mask is primarily designed for night time use, but if you would like to use during the day make sure you follow with an SPF 30 or higher. Why is this product positioned as a mask, it feels more like a moisturizer? A moisturiser is designed to be absorbed more by the skin, whereas the texture of this mask is formulated so that it stays on the skin and has a long-lasting hydration effect, that’s why you still feel the mask on your skin in the morning.